Bernie, gotta love the "port of Aunt Jane" sign. Thanks for the nostalgic view as I anticipate my trip north Monday. Is that the SENTRI lane? And did the vendors wear suits? Hope you can post more pics like this. It was really enjoyable. Wow ---- Some things never change. Look at the car on the right trying to crowd into line. And, they had internet back then. The sign says International.com..
Nice eye, Dennis! How many stars on that US flag? The one with the big red maple leaf. And 500,000 people answered, "You have a point there," and decided to stay. Welcome to Baja! You last one is my favorite---have it somewhere but just can't locate it. But wait until Prohibition begins! I love the hand colored fotos. It's a true craft. I LOVE HISTORICAL PHOTOS !!! Those are just GREAT photos. Thanks for sharing them. I too love historical photos. The photos and archives that NOMADS have are amazing. I admit that my TV is on less in favor of furthering my education. "How did you find out about that?" is a frequent question from my new neighbors. BAJANOMAD is often my answer. I JUST LOVED ALL THIS OLD PICTURES - and it does show also, that people just have had the same desires way back. Must be within human nature, to seek certain places of Beauty. Isn"t it? Anyhow was a good idea to bring that in on here! Thank you Bernie - for starting it. Where do these pictures come from? I'd love to see a couple of hundred more of them. Thet really fire up one's sense of nostalgia. There's a glass shop, between 4th and 3rd, that has the best collection I've ever seen. It's a rock toss away from La Moneda money exchange on 4th but I can't recall the street. [ it's one street south of the river ] I'll find my map and let you know. Don't bother asking this guy for copies or anything like that. He is very protective of what he has. 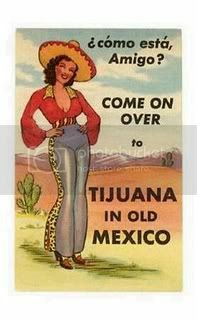 I wonder when and why the name Tia Juana was changed to Tijuana. There are many on the San Diego Historical Society website. This has been addressed by the gentleman from the Tijuana Historical Society - and FDT. While I believe the "Rancho Tia Juana" land grant refers to the place by a number of names, the gentleman in Tijuana believes that there is confusion, because the area around San Ysidro was first called Tia Juana or Tia Juana City - with suburbs planned named Tia Juana Junction and Tia Juana Heights. That area was also known as the Tia Juana River Valley. When you gonna write a book! Love to see someone else looking at this old stuff...........for me it is fun. Baja Guy here is an old Picture of the Jack Dempsy Hotel.............the one that most Nomads just wiz right past enroute to the 'real' Baja. Caboron, oh, that poster is great!